Today, we're meeting with Mila A. Ballentine, a mystery author with several titles under her belt, including The Legend of Turtle Pond and Back Away From the Shoes. Let's give her a big welcome! Tricia: Tell us a little about yourself, Mila. Mila: First, I would like to thank AUTHORS TO WATCH for interviewing me and providing an outlet for authors to share their work. My name is Mila A. Ballentine and I write mysteries. I believe in the power of words and the effect they have on others. Writing children, young adult and adult mysteries allows me to evoke emotions in others. So, I write stories with the hope of entertaining my readers while challenging their moral compass. I am a City Slicker, and I enjoy sightseeing around my hometown, New York City but I was born in a laid-back country setting. My hometown is instrumental in my writing process; it allows me to socialize in a multicultural atmosphere while appreciating the differences and similarities we all share. The Legend of Turtle Pond: The Initiation of Tabitha Obrien (coming soon). Mila: A few years ago, on my mother’s birthday, I woke up and had a story to write. My mother was no longer a citizen of this world but I would like to think it was a gift from her, awakening a sleeping giant within me to come out and play with the world. I began writing that day and three months later, I had a 40,000 word manuscript. Mila: Back Away From The Shoes, a ‘glamazon’ mystery is my most recent book. If you love solving mysteries and enjoy fashion, you will love this story. Here is the blurb: Life was a breeze for Casey Sullivan, until she was blindsided by the unthinkable. Working at the Reinhold Detective Agency comes in handy when the worst and best moments of her life collide. She embarks on a quest that turns out to be more than she bargained for. 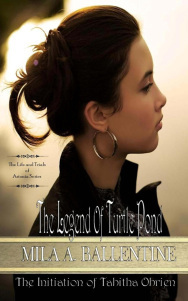 Also, The Legend of Turtle Pond: The Initiation of Tabitha Obrien is a historical paranormal mystery that will be available on February 5, 2013. It is book one of my first paranormal series, The Life and Trials of Astonia. Here is the blurb: The Legend of Turtle Pond chronicles the voyage of the Obrien family as they traveled across the Atlantic in the 19th century to Astonia, a land where trickery runs rampant and tests their endurance and strength of character. Opportunities were ripe for the picking, but they would have to conform, and the cost was more than they had imagined. Tricia: They both sound wonderful. How did you get the idea for these books? Mila: I have yet to meet a girl who did not like shoes no matter their age. I love fabulous shoes and I love mysteries. I thought it would be a fun idea to combine both concepts and thus Back Away From The Shoes was born. In addition, the idea that spawned, The Legend of Turtle Pond: The initiation of Tabitha Obrien came from one of my frequent adventures throughout New York City. If you would like to know more, I have an article on my blog: The Initiation of Astonia: The Life and Trials of Astonia Series. Mila: The challenging aspect of writing mysteries is to not give away too much information but still be able to keep the reader engaged until you are ready to let them in on the secret. I think readers appreciate it when they have an ‘Aha Moment’ without the author telling them. Tricia: Of all your characters, which one is your favorite and why? Mila: My favorite character is Tabitha Obrien from The Legend of Turtle Pond: The Initiation of Tabitha Obrien. Tabitha, like most of my characters is likable but she walks the fine line between good and iniquity. Perfection is something many strive for but often fall short. I am interested in the avenues the characters take before they get there. Mila: Solaura, an eccentric character that mimics an actual person was a chore to create. The young lady Solaura is fashioned after was particular on how she should be portrayed. She loved what I came up with, so I am happy. Mila: I research the book in question to see if there is any validity to their claim and make improvements where necessary but I do not allow it to take the wind out of my sail. For each book that makes the bestseller list there will be someone who will say that they did not like it or they thought that the language was less than desirable. Mila: There will always be someone who is a better writer than you are. The trick is to do your best and perfect your craft. You can follow Mila on Twitter: @milaaballentine --- Facebook.com or visit my blog: Milaballentine.blogspot.com Also, I have a ‘Back Away From the Shoes Review Contest’ posted on my blog. You are welcome to enter for your chance to win a fabulous prize! Thank you for taking the time to interview me. I had fun chatting with you.Thank you Mila. Yes Tonya, I've written poetry since elementary school but I never thought of writing a book until that day. It's a precious gift my mother gave me along with her quirky personality. I am so grateful for the gift of writing and happy to share it with the world.